For my sister, Nina, being chosen to represent Bulgaria at the Special Olympics in Abu Dhabi in March 2019, is a dream come true. But a dream she will be fulfilling with her heart back at home in Syria. 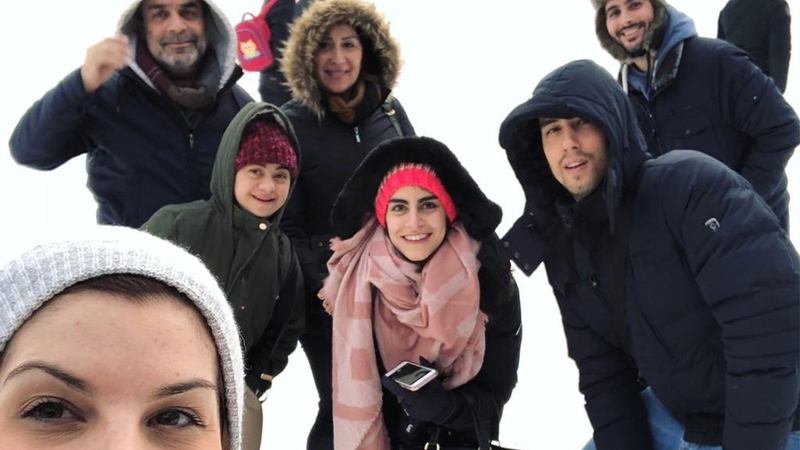 In previous years, Nina has represented Syria at the regional and international Special Olympics in several countries, including Syria, the United Arab Emirates (UAE), Egypt and Greece. Next year, she gets to represent her second home, Bulgaria – a country my family moved to because of the ongoing war that tore apart our country and dispersed so many Syrians. For Nina, representing two different countries was confusing at first, but now that she has acknowledged that we are not going home anytime soon, she has chosen to adapt to the fact that Bulgaria is her new country. Nina was born with Down syndrome on June 4, 1985, in Homs, Syria. According to the National Down Syndrome Society, Down syndrome is when an individual has a full or partial extra copy of chromosome 21. This additional genetic material alters the course of development and causes the characteristics associated with Down syndrome. It is the most commonly occurring chromosomal condition. According to the World Health Organization, approximately one in every 1,000 babies in the world is born with Down syndrome. But what doctors do not tell you is that Down syndrome is not a sickness, nor a disability, and it’s certainly not an obstacle – it simply should not affect any stage of a child’s life or the way we treat someone who has it. In 1985, there were no tests to show if your unborn baby carried an extra chromosome in Syria. So the doctors found out Nina had Down syndrome after she was born. “Your baby has Down syndrome,” the doctors told my mother, words she remembers until today. “When Nina was born, I was wrenched in depression,” my mother, Souad al-Jundi, said. “The mid-80s were not the time for a girl like Nina to be born. We both faced so much rejection and sometimes, mental aggression, but as years passed by, I stood by her and she became the person who I am proud of,” she said. My family moved to Damascus in 1990, which is when and where I was born. Nina and I started school together, but Nina switched to several other schools until teachers informed my mother that she will be needing a special educational programme. In 2005, the first school for children with special needs opened its doors in Damascus, and after Nina joined the school, she began to feel like she belonged to a growing community. Nina is probably the only person I know who fights to go to school, even when she is so sick she cannot leave bed – education means everything to her. Growing up with a sibling who has Down syndrome is just the same as growing up with a sibling who does not. For those of you wondering, she never fell short of being there for my brother and I. Nina inspires us to be the best version of ourselves. Nina and I share clothes, we share midnight talks, we share our love for sports, we share friends. We shared a room and a beautiful childhood in Syria together. She will always be my big sister, someone I look up to and someone I will always share happy memories with. My mother Souad dedicated her whole life to raising awareness about children with special needs, encouraging parents to speak out about the subject and ask questions when they feel stuck – instead of giving up and isolating their children. She taught herself about it, she gave lectures and toured the country to give workshops about it. She eventually joined the family committee of the Special Olympics, and she taught English and arts to children with special needs – and even chose the topic “The Effectiveness of a Phonic Reading Method in Teach Reading Skills for Teenagers with Down Syndrome” for her PhD dissertation, which has been published online. My mother has done so much she deserves a book to be written about her journey in which I believe she has redefined determination and resilience. My father, Bassam Rifai, loves Nina with all his heart, he is her biggest fan and always makes sure Nina gets what her siblings get too. My father has always said that Nina has always been loving and caring at home. “Despite there being a challenge sometimes to represent her as someone who could contribute to society just as anyone else, we managed to turn that into a fact,” Bassam said. My brother, Shoueb, loves Nina so much and he cares for her in the most beautiful way. He was always overprotective of her and made sure we both know that, whatever happens, he will always be there. He has a special place in Nina’s heart – they were born just a couple of years apart. Shoueb thinks that growing up with Nina has opened his mind and made him question life, destiny, creation, religion and everything that helped him understand life better altogether. Most importantly, my brother and I both believe that through Nina our parents showed us in practical terms what acceptance, selflessness and commitment means. 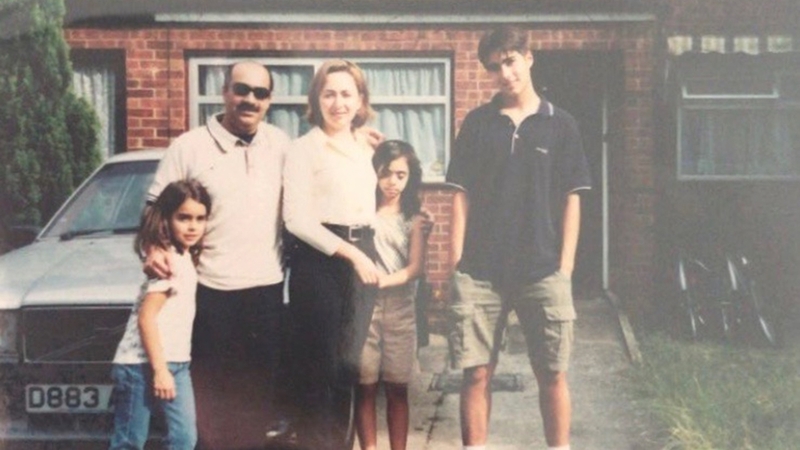 “Your mum and dad are just an amazing lesson on how to keep going regardless of what gets thrown at you,” Shoueb would always say. Nina grew up developing incredible talents. She loves to read, she speaks three languages (English, Arabic and Bulgarian), she loves sport, she loves horseback riding, and she loves meeting new people. Nina also loves photography. Her photos of Damascus were displayed and sold at an art gallery in the city; she loves art and was inspired by it because my mother is a painter – we both used to sit in my mother’s art room for hours. Nina was so creative that anything her teachers would ask her to do, she would turn into a masterpiece. 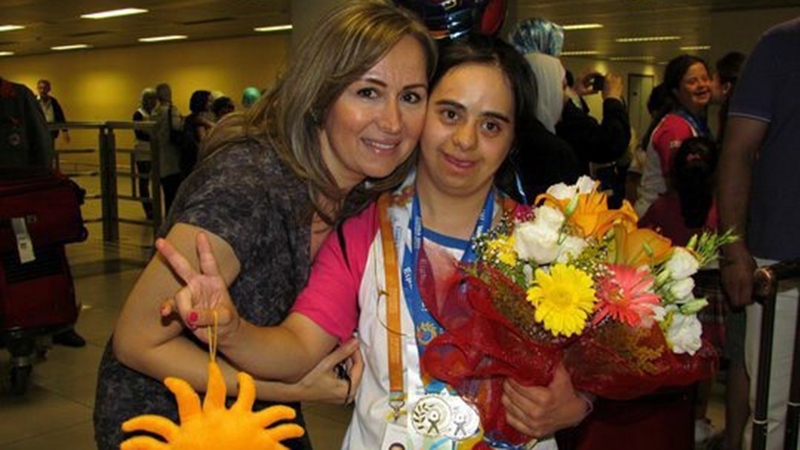 When she joined the swimming team in Damascus, her coaches were so impressed they suggested that she should join the Special Olympics, which is how her journey began. Along with her team, Nina participated in her first Special Olympics in the Regional Games in Egypt, the UAE and Syria. She later participated in her first International Special Olympics in Athens, Greece, in 2011 and came home with a gold and a silver medal. A few months after Nina returned home from Athens, the war in Syria was getting worse and the situation became unsafe. Everyone in Syria at this point was thinking of a plan B; things were unclear but people knew something was not right and the uprising was not heading anywhere optimistic. When we would hear gunshots or explosions, Nina would get frightened and cry endlessly, she was so confused. We left Syria in 2012, and since my family and I have been through so much, moving from one place to another. War is ugly, but what is uglier than war is the trauma that comes along with it. We were all heartbroken and it took a long time to feel settled. We left behind family, our home and most of our belongings. We left behind a home we have always lived in, a home that had endless memories. Nina was heartbroken for leaving her friends in school, her swimming team and everything she spent years building. She had finally felt like she belongs to a growing community at school, a community that appreciates her. Nina could not understand the concept of war and why it was happening in our country. We kept trying to hide the news from her. Nina was so sensitive about it she would cry every time someone would even say the word Damascus. She felt as if her dreams of swimming beside her teammates were over. Years went by, and now my father, mother and Nina have moved to Sofia, Bulgaria. 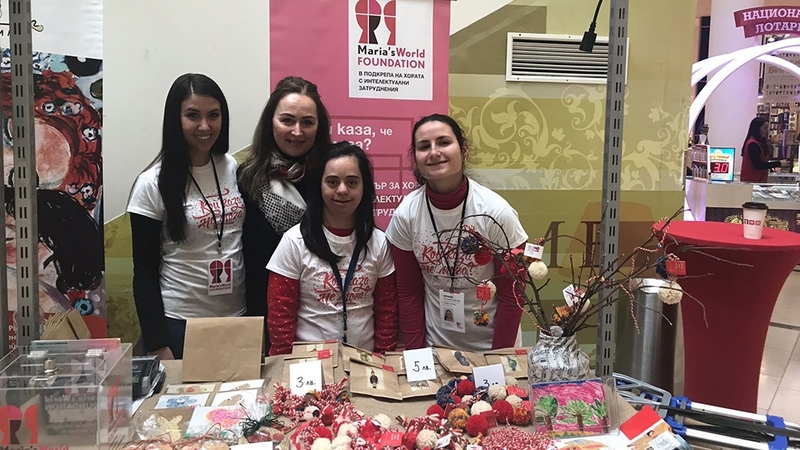 Nina joined Maria’s World Foundation, a remarkable centre that supports people with intellectual disabilities, and she instantly felt at home. She started taking Bulgarian lessons again, started going to horseback riding and joined the swimming team. She was recently chosen to represent the Bulgarian national swimming team at the Special Olympics, scheduled to be held in March 2019. Of all the things Nina loves, she loves Syria the most. I do not think I can ever be more proud of being Nina’s sister. She is truly a star.